It seems that Warner Bros. is going the extra mile to promote their highly-anticipated Kong: Skull Island, with a new aerial video from a Los Angeles news station that shows some massive King Kong footprints that have mysteriously surfaced on a local beach. The video reveals that these footprints span 25-feet long by 12 feet wide, which were created in conjunction with the Los Angeles premiere at the Dolby Theater in Hollywood tomorrow, Wednesday, March 8. If that wasn't enough, we also have new TV spots, along with a few videos where star Tom Hiddleston explains why this movie is not a remake, sequel or a prequel. Fox LA debuted this new aerial video high above Dockweiler State Beach near the Los Angeles International Airport (LAX), with the reporter hinting that there may be a few more footprint sightings around L.A. between now and the premiere. Warner Bros. has also debuted three new TV spots for this action-packed thriller, along with a series of videos where stars Brie Larson, Samuel L. Jackson and Tom Hiddleston answer some popular Google search queries, which uncover some very interesting details about this story, and Kong itself. For example, Brie Larson confirms earlier reports that King Kong is in fact over 100 feet tall, while Samuel L. Jackson discusses where Skull Island is actually located. It's possible that we could see more of these videos with the rest of the cast chiming in, regarding popular Google searches about Kong: Skull Island. The rest of the cast includes John Goodman, Corey Hawkins, Jason Mitchell, Tian Jing, John Ortiz, John C. Reilly, Shea Whigham and Toby Kebbell. It was confirmed last week that Kong: Skull Island will have a post-credit scene that will include hints at Godzilla and the iconic monsters King Ghidorah, Mothra and Rodan, who have been confirmed to appear in the sequel Godzilla: King of Monsters, arriving in theaters March 22, 2019. 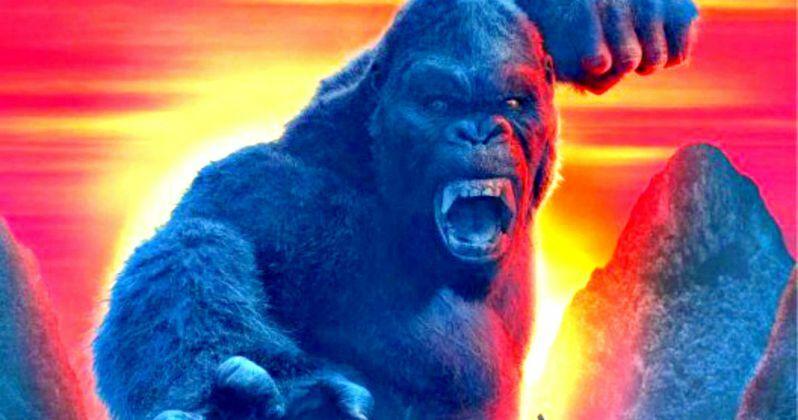 That movie will then set up the highly-anticipated Godzilla vs. Kong, which is slated for release on May 29, 2020. Take a look at these new videos for Kong: Skull Island below along with a ton of new International and stateside posters.